Aim: Malfixed miniplates can impair fracture healing, and the screw pilot holes may widen during repeated fixation trials. 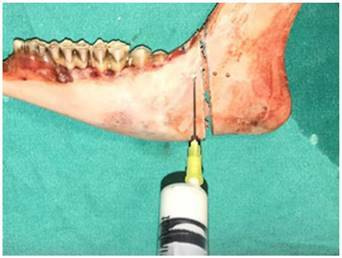 This in vitro study explored the extent to which screw fixation of mandibular angle fractures could be improved by augmenting the drilling holes with polymethylmethacrylate (PMMA). Materials and Methods: We measured stabilization by recording specimen displacement under a vertical force of 50 N applied using a hydraulic tester. We included 20 hemimandibles from sheep (average weight 40 kg). The specimens were randomly divided into two groups of 10 and pilot holes were created in the angulus region using a drill 1.2 mm in diameter. Next, we performed osteotomies simulating angulus fracture repair. In group 1, the fracture site was fixed using non-compression miniplates and four screws were inserted to the maximal possible extent employing a mechanical screwdriver. In group 2, the pilot drill holes were filled with PMMA prior to miniplate fixation. Then vertical forces of 50 N were applied to the molar region and the displacements were measured. The Shapiro-Wilks test was used to compare the two groups. Result: The maximum average displacement in the experimental group was significantly lower than that in the control group (p=0.026). Thus, PMMA-augmented screws better stabilized bone, affording reliable fixation. Of the various mandibular fractures, angular ones are the most frequently encountered (30% of all fractures). The optimal treatment remains controversial. The anatomical neighborhood and biomechanical difficulties associated with manipulation of the bone suggest that several treatment options should be explored [1, 2]. Many studies have used different numbers of miniplates and screws at different positions in the angular region. In one study, a single miniplate fixed to the lateral aspect of the mandibular angle served as a tension band, and was associated with a low complication rate (12-16%) [3, 4]. Champy et al. reported that miniplate placement on the lateral aspect of the mandible enhanced fracture healing . It is crucially important to apply miniplates correctly. However, the angular region is not easily accessible; the buccal tissues restrict surgical access. Malcontoured/malfixed miniplates may impair fracture healing, which is associated with bone resorption and screw loosening [6, 7]. It is essential to fix miniplates and screws to the bone firmly. Drilling and forces applied by screws to thin cortical bone can cause new fractures. In addition, vessels, nerves, and tooth roots can be damaged during these steps [8, 9]. Often, repeated fitting trials are required to ensure the desired stability, causing complications such as screw loosening, displacement, and back-out . Polymethylmethacrylate (PMMA) is widely used in orthopedic surgery. It is a biocompatible acrylic resin that can be prepared during or prior to operation . During orthopedic surgery, PMMA is used to ensure bonding to bone. Many studies have shown that pedicle screw augmentation with cements such as PMMA improve screw fixation . Here, we explored the effects of PMMA on screw stability. We applied PMMA (Cemex, Tecres, Italy) to screws before attaching them to bone. Our hypothesis was that mandible angle fractures treated in this way would exhibit less displacement under hydraulic pressure. The whole study was done on the same day. We obtained 20 hemimandibles from sheep (average weight 40 kg) that had been fed under similar conditions. The specimens were kept moist and refrigerated at 4 °C until testing procedures were performed. 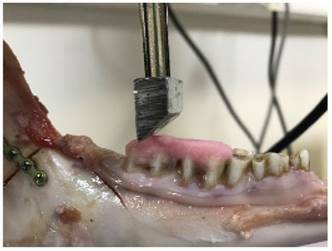 Skin, muscle tissues, coronoid processes and condyles were removed from the mandibles to create the physical conditions required for the experiment. For each specimen, the boundaries of an angular fracture line were first drawn with a surgical pen. The hemimandibles were randomly divided into two groups of 10. To create the pilot holes, grade 2, titanium, non-compression, four-holed straight miniplates 1 mm thick (Medplates, Istanbul, Turkey) were placed on the angulus, centered on the osteotomy line (Fig. 1). The drill was 1.2 mm in diameter (Medplates) and was operated at 1,500 rpm while holding the miniplate to ensure correct localization of the holes. Physiological saline was used to cool the bone and wash away debris formed during drilling. 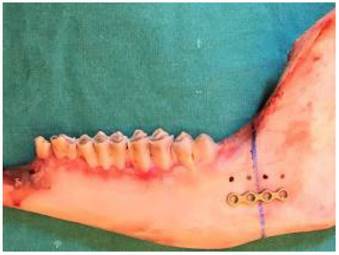 Under saline irrigation, a diamond particle saw driven by an electric induction motor was used to create bicortical osteotomies in the cortical bone. As the sheep mandible is smaller and weaker than the human mandible, a chisel and a hammer were then used to create a proper angle fracture (Figs. 2, 3). For an accurate stabilization and standardized screw force appliance, test materials were clamped between two steel plates. All the screws were inserted by the same surgeon. For avoiding over drilling, no pressure was applied on the screws. In group 1 (control), fracture line stabilization featured placement of non-compression miniplates fixed with titanium grade 5 screws 2.0 mm in diameter and 11 mm long (Medplates). In group 2 (experimental), PMMA (Cemex, Tecres, Italy) was prepared 3 min prior to use; PMMA assumes a toothpaste-like consistency over 3 min as suggested by the manufacturer company. 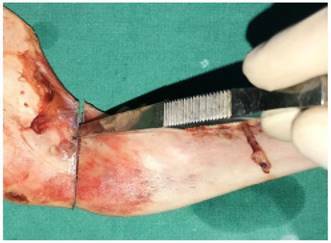 Using a 10 mL syringe, PMMA was applied to the screw tracts via retrograde injection prior to miniplate fixation (Fig. 4). Osteotomy line was drawn using a surgical pen and preparation of the pilot holes. A chisel used as an osteotome. As mechanical screwdriver, a torque adjustable physiodispenser was used in both groups. In dental implant insertion mode, screws were placed at 40 Nm of torque (Fig. 5). Immediately after injection, the screws were inserted until they stopped turning (Fig. 6). PMMA application using a 10 mL syringe. Insertion of screws using an electronic screwdriver. 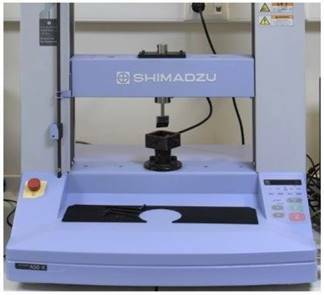 An L-shaped metal device with three lateral screws on each side was used to fix the hemimandibles to the hydraulic test device (Universal Autograph AGS®, Shimadzu Scientific Instruments, Kyoto, Japan) (Figs. 7,8). The occlusal surfaces of the teeth lay parallel to the horizontal plane of the machine, and were flattened with resin so that the force cell could not slip (Fig. 9). A progressive vertical force was applied in the area of the molar teeth; the force sensor was fixed at the head of the test machine. 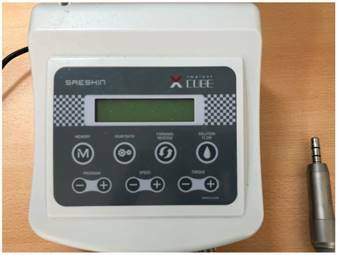 The machine was programmed to stop force application at 50 N and then to record the maximum vertical displacement at a displacement speed of 5 mm/min (ELISTA Electronic Informatic System Design Ltd., Istanbul, Turkey). After the device had been calibrated at 0 N, increasing forces from 0-50 N were applied to the occlusal plane. Addition of resin to flatten the occlusal surfaces. We compared data from the two groups using IBM SPSS software ver. 22 (SPSS IBM, Istanbul, Turkey). The Shapiro-Wilks test was used to confirm that the data were normally distributed. Student's t-test was used to compare the two groups and the level of significance was set to p<0.05. None of the study models failed during testing and they met the criteria for this biomechanical study. The displacements and mean maximum displacements (with SDs) of each group under a force of 50 N are shown in Tables 1 and Figure 10. The average maximum displacement of the experimental group was significantly lower than that of the control group (p=0.026, p <0.05). Only one experimental specimen exhibited a displacement greater than the mean control value. Displacements of at 50 N of applied force. Mean displacements of sheep hemimandibles. In this study, we aimed to investigate whether the PMMA cement improved the fixation of the screws to the bones during miniplate osteosynthesis and the stability of fracture fragments. For this reason, it was aimed to compare the values of two groups under a certain force rather than the value of force applied. There are many studies in the literature investigating miniplate / screw durability and stability under certain forces. In these studies, properties such as the length, thickness, material, number of screws, screw length, screw diameter were examined and various results were obtained. In our study, we aimed to investigate whether we could increase the stability of the fracture line with PMMA cement without changing the screw-plate systems used as standard. Of all mandibular fractures, angle fractures are the most common, and the optimal treatment options are not clear [1, 2]. Champy miniplate fixation has been shown to be effective in many clinical trials and studies. 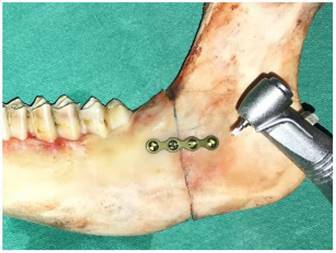 Fixation of a single miniplate with monocortical screws is reliable, associated with few complications when treating mandibular angle fractures [13, 14]. 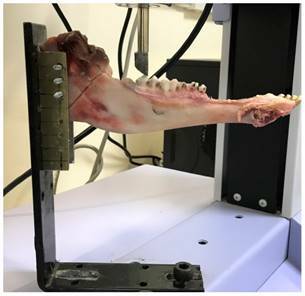 Sheep mandibles resemble human mandibles in terms of both thickness and size and thus are commonly used experimentally . Researchers use resin models to ensure standardization in tests. However, besides their advantages in standardization, the resin models show different properties from fresh bone due to their elasticity properties. Use of fresh mandibles of animals is the best indication for in-vitro studies . We employed fresh sheep mandibles to mimic the human mandible. In a study of mandibular angle fractured patients treated with Champy technique with miniplate osteosynthesis, the bite forces between molar teeth was 90 N in the first week and up to 148 N in the sixth . To collect clinically relevant data, we applied a vertical force of 50 N when evaluating screw displacement and resistance immediately after inserting the screws. Since we want to evaluate the stabilization obtained during the operation, a vertical force of 50 N was preferred which was less than the value of the first week bite forces. Findings of forces lower than 50 N were not included in the study as the reliability of the force sensor was suspected under forces smaller than 50 N. Heidemann et al. showed that the holding power of a pilot screw hole decreased when the inner diameter was >80% larger than the screw diameter. Here, the holes were of diameter 1.2 mm, thus 66% of the screw external diameter (2.0 mm) . Many methods are used to improve screw retention forces. It is not always possible to increase screw diameter or length because of the anatomical neigborhood. In addition, use of large-diameter screws creates a risk of cortical plate fracture. Most iatrogenic trauma occurs during drilling of pilot holes or fastening of screws [17-19]. Fixation must be enhanced without increasing screw diameter or length. We believe that the application of PMMA to the prepared screw holes reinforces the connection of the screw to the bone by filling the gaps between the screw and the bone to form extra retention areas. 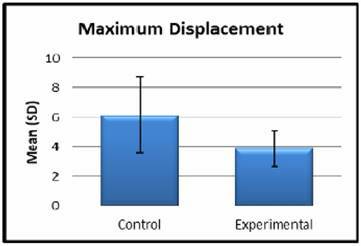 The results of this study supports our hypothesis as the displacement in the PMMA augmented experiment group is significantly lower than in the control group. Many studies have shown that calcium sulfate, calcium phosphate, and PMMA cements are effective in terms of screw augmentation [12-14, 20]. PMMA is the most readily available, cheapest, and biocompatible of these materials, allowing immediate fixation to cancelleous bone (which is not usually the case for the other materials; ). Screws augmented with PMMA cement exhibit inproved primary stability [21, 22]. However, there are no data on using this technique in the maxillofacial region. 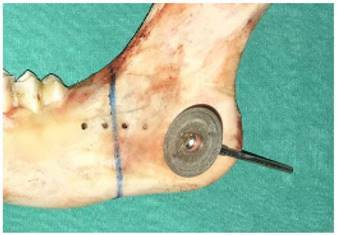 We used PMMA cement to augment screws, seeking to reduce hemimandible displacement under a vertical force. Our results support the studies cited above. PMMA leakage into, and PMMA-mediated compression of, soft tissues, nerves, and vessels is of concern. In addition, it is unclear what the appropriate quantity of PMMA to inject is. We believe that greater amounts of PMMA improve fixation stregths. However, as the amount of PMMA increases, there may be leakage to the surrounding tissues and fracture line, which may lead to delayed recovery. We should mention several key features that minimize cement leakage. First, a short syringe needle should be used; it is important to avoid penetrating the lingual cortex. We had to work quickly before the PMMA hardened and we perforated the lingual cortices of a few specimens. Second, PMMA of high viscosity should be used; this minimizes leakage. We injected PMMA when it had a toothpaste-like viscosity. Third, we used the retrograde injection method of Chang et al. to place the PMMA . This fills the entire screw tract, improving fixation stregth . Fourth, after hole-filling, the monocortical screws and miniplate should be placed immediately. Three-dimensional (3D) navigation using computed tomography can be used to place both screws and PMMA . Yazu et al. employed fenestrated screws to reduce cement leakage ; such screws were superior. These screws are of the the same shape as ordinary screws, but are hollow and bear 20 small holes 1.3 mm in diameter. Cement fixation of such screws in osteoporotic spines was better than cement fixation of ordinary screws. We suggest that PMMA injection through fenestrated screws, or under the guidance of a 3D navigation system, would afford safer and better integration with bone. The rapid curing of the PMMA cement was one of the hardest points in the experiment. We have solved this problem by preparing separate PMMA cements for each hemi mandible. In situations where more than one miniplate should be used clinically, we recommend preparing separate PMMA cements for each miniplate. Otherwise, hardened PMMA cement makes screw- pilot hole adaptation difficult or impossible. As the freshness of the hemi mandibles were important for obtaining significant results number of subjects used were limited. Force applied in only one direction and the living tissue reactions of the PMMA cement were determined as the limiting factors of this in vitro study. In this study, we aimed to increase the stability of the fracture lines while decreasing the displacement values without changing the screw-plate systems. According to our results, we have concluded that stabilization of the fracture line is significantly better in the PMMA augmented experiment group. In clinical practice, especially when rigid fixation is impaired, we believe that fracture line stability can be guaranteed by PMMA augmented support when the plate screw is not fully setted and the fixation rigidity is suspected.